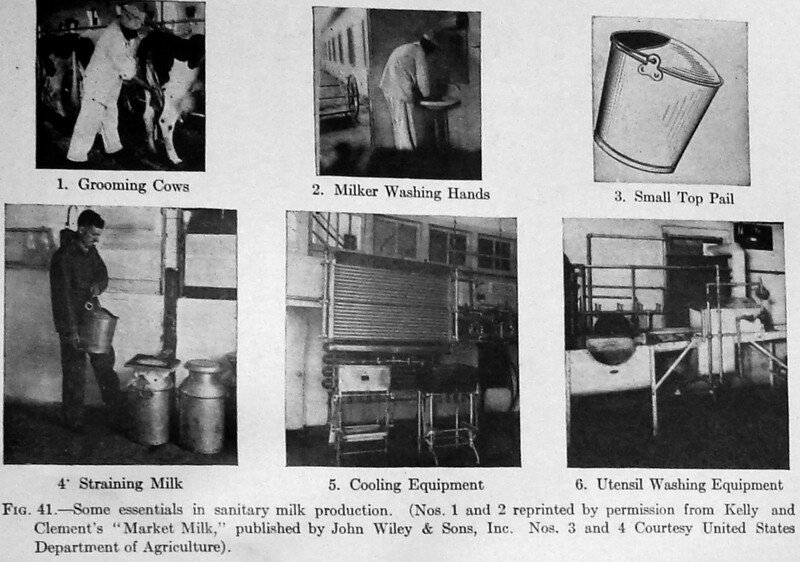 How to ensure quality milk and tasty milk in a sanitary, yet non-toxic, method for cleaning. Cleaning milking equipment is one of the most important steps in producing safe and quality milk, one that is often overlooked. 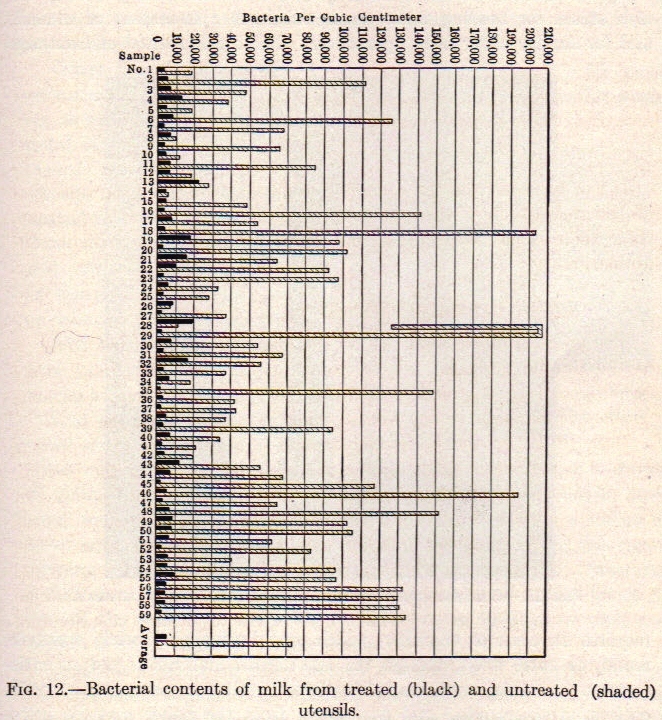 If your milk is all tasting “off” and your cows are healthy, this may be the time to re-evaluate cleaning protocols. Bacteria are most often not seen – you may taste an off flavor and that may be the only indicator! More importantly, an effective cleaning routine is important in daily routine to ensure safe milk production. 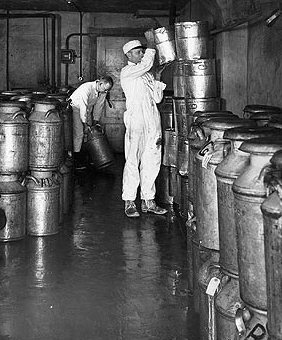 Whether for one cow or a thousand – milk handling is an important and unique process! Cap the milk and place somewhere to cool. A good rule of thumb is below 40-45F within 2 hours. This can be as simple as setting a timer and placing the milk in a freezer (2 hours for half gallon, 3 hours for gallon). In the winter, a snow bank on a cold day is one of the best methods. In summer, the freezer or a chest freezer converted to a cold fridge with ice water bath is excellent. Note that water to water (milk in jar) contact cools faster than air to water (milk in jar) contact. A handy way to clean inflations and the lid WITHOUT getting water in-between the inflations and stainless shells is illustrated in the picture. (Liquid anywhere that vacuum air gets to is another potential source of contamination, even though the milk doesn’t touch those pieces, that air does come in contact with the milk.) So, I pop off the two center air hoses on the shell/inflation end (those stay attached to the pulsator, like lobster feelers) and the two outer air hoses pop off of the pulsator and I loop the two air tubes that are still attached to the lid around onto the two inner inflation air hose ports. I can then scrub the lid all over and no water gets inside! The best tool for cleaning the inflations is an inflation brush – the cheapest yet most useful tool a dairy farmer could ever want! 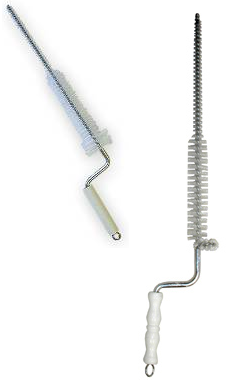 I like the style on the left (doesn’t have the metal curl near the handle) because that works best for my narrow bore Surge inflations. The other style may work better on wide bore inflations (if you have an opinion on this, please let me know! Be sure to take off and wash the large gasket seal inside the bottom rim of the lid, milk tends to get up under the gasket. Also clean the check valve and keep that in a safe spot so it does not get lost! Lastly, clean the bucket. Start by rinsing the bucket with lukewarm water. I sprinkle a little powdered dairy soap in the bottom of a wash bucket that is used only for wash up and top off the bucket with super hot water. Scrub everywhere inside twice with a wash cloth then scrub the outside (I try not to wash inside the bucket once I’ve started scrubbing the outside, just because the outside tends to be dirtier). Rinse thoroughly (start with lukewarm water, once soap is gone do a final hot water rinse). I use a powdered dairy soap that is safe to use on stainless steel. Others use diluted peroxide or dish washing soap. 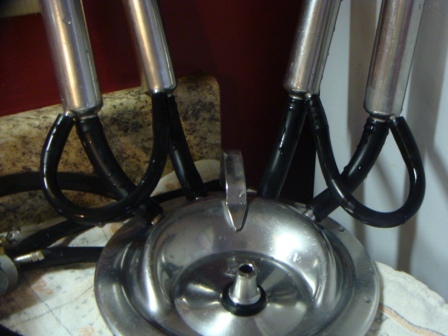 One or twice a week, sanitize milking parts. I soak everything in ACV (apple cider vinegar) as a natural “sanitizing rinse”. What that entails is spraying all the surfaces with straight ACV, letting it set in the utility sink to soak for a few hours, then rinsing off the vinegar and residue that comes off the machine. Be sure to thoroughly rinse the machine and let it dry before milking, as residue makes for unpleasant milk taste. Our milk flavor has been the best since we started ACV soaks! Commercial dairy acid and alkaline wash/rinse/sanitizers are all available, but use depends on your preference for the amount of chemicals you feel comfortable using. The most important thing to remember about milking equipment is this: equipment in contact with milk fat and protein “milk stone” is notoriously difficult to keep clean. Only a strong acid cleaner can guarantee the removal of milk stone. So, even if you only use it occasionally, some sort of acid rinse is very important. Make sure the equipment is kept in a place where it can all dry completely and is not exposed to much dust. Near a sunny window is ideal! Hangers can be purchased or built to encourage proper drainage. We use a kitchen dish drainer. Most importantly, remember: The BEST milk comes from CLEAN cows! At beginning of each milking, your machine is clean. Pre-rinse with very hot water with a dab of chlorine (at beginning or before each cow). This will ensure the line is clean (no dust, etc.) and warms up the inflations, so the rubber is soft. Milk the cow(s). You can light chlorine rinse between cows or not, your choice. Cleanup: rinse everything with cool tap water, the rinse everything again with cool tap water. Shake/agitate/swish to get water cleaning off the milk residue. Powdered chlorine CIP non-foaming soap and warm water (110F), scrub with gloves. Rinse with 120F water to remove soap residues, then rinse with HOT water for a final rinse. Invert on drying racks in front of south-facing windows for sun contact and good ventilation drying. Twice a week, after a milking, do an acid rinse. This is the LAST rinse of the process, then leave the acid solution on everything to work. You have to be extra careful to make sure when you do your next milking not to skip your pre-rinse! Pre-rinse will wash out any milk stone that has come off from the acid. Rinse with plain hot water, no need for any chlorine in this pre-rinse. As a side note, the regulations about having a clean, screened, dust-free, fly-free bird-free environment for your milk room is important for the drying process of the equipment each day. Also, Jay loves the GLAZED concrete blocks for easy cleaning and they look brand new forever. Prompt Washing Necessary. If residue is left on the utensils, there will be rapid multiplication of bacteria. Furthermore, milk solids dry on the surfaces and are more difficult to remove. Washing Utensils. Utensils should first be rinsed in clean, cold or lukewarm water and then washed in hot water containing an alkali or soda-ash washing powder. It is necessary to scrub them thoroughly with a stiff brush, avoiding the use of wash rags, soaps, and greasy powders. A final rinse in clean water prepares the utensils for final treatment. Steam Treatment of Utensils. Steam is by far the most satisfactory agent. It is positive in its action and has the additional advantage of leaving the utensils hot, so that they will dry quickly. Steam boilers/jets/tanks are a valuable adjunct to the farm dairy. Treatment with hot water. If no steam is available, utensils may be boiled in water for 5-10 minutes. Rinsing with boiling water is not sufficient. The Importance of Drying Utensils. Experiments have shown that bacteria increase rapidly on the hot surfaces of moist utensils. NOTE: A modern household tool, the dishwasher, is an excellent method of steam/hot water sterilization! Just before milking time, you can sterilize your jars, ensuring no harmful bacteria coming from the jars! Part of dairy sanitation means starting with clean water. 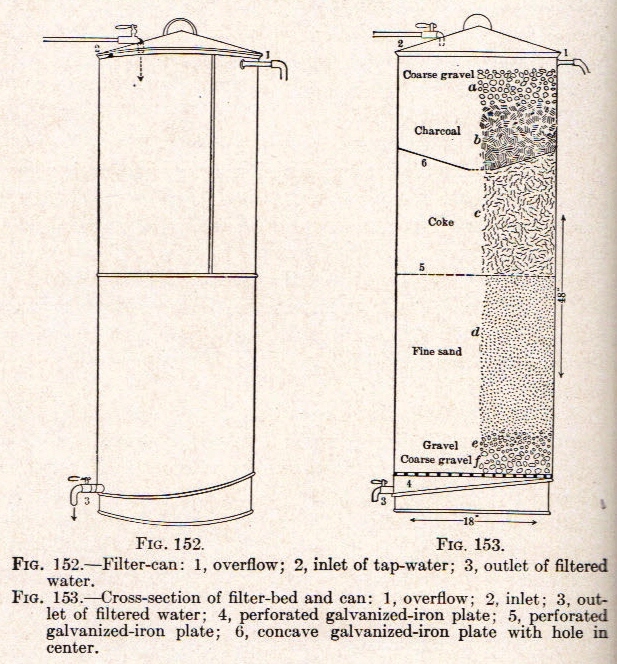 Method of Purifying wash water through filtration. Use an 18 inch wide can that is 48″ tall. From bottom, fill with 2 inches small flint stones; 22 inches fine sand; 12 inches fine coke; 9 inches charcoal; 2 inches fine stone or coarse gravel. Bottom of can is slanted so no water can settle there. Inside are plates near the bottom horizontally and one on top of the fine sand that are perforated. Another plate is concave, put in above the coke, to keep the water heading in the center of the filter. Filter made by the Iowa Experiment Station. Older German investigators believed these filters to have almost miraculous powers of removing organisms from water. Alkaline Cleaners and Sanitizers have a very high pH (11-13.5), chlorine (200ppm) for example. Use cheap test strips to determine amount of chlorine in solution. Acidic Cleaners and Sanitizers have a very low pH (2-4) and range from strong man-made acids to simply vinegar or iodine (25ppm). Always wear protective equipment if working with chemicals! Use disposable supplies wherever you are unable to properly sanitize reusable equipment. Only use chlorine based chemicals on approved materials. Chlorine can be corrosive if used on many materials, some chlorines are specifically made as “safe for stainless steel” while others are not. Regularly clean and sanitize your drains. Never enter the room in dirty barn clothes. Prevent contamination from shoes by using a foot bath, disposable plastic covers, or by changing your shoes between rooms. Milksone buildup will allow bacteria to stay on your equipment. Regular sanitation prevents stone buildup if used in a proper sequence (see steps in cleaning section). Always pre- rinse first with lukewarm water to remove milk fat and protein. Always follow the proper procedure for sanitation. If the container says to soak a minimum of 2 minutes, you must do that for all the bacteria to be killed. Always final rinse in very hot water. The steam will dissipate faster so the equipment will be dry faster. To be 100% sure of cleanliness, sanitize again before using any equipment or tools. For example, run your jars through a dishwasher on a sanitize heat cycle just before milking time.